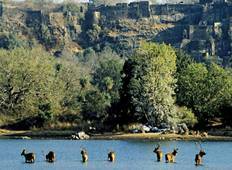 Find a Wildlife trip that explores Ranthambore National Park. There are 48 tours to choose from, that range in length from 3 days up to 23 days. The most popular month for these tours is November, which has the most tour departures. "Great tour of the Golden Triangle and Ranthambore. All went smoothly and was a great..."
"Trip was fantastic! everything was well organised by the company. Driver, all the..."
"It was one of the best tour we have ever had. We highly recommend the services of..."
"Great tour! Hit the big sights! Our driver was great. They do take you to a lot of..."
"The hot water was only available between 6 am and 6 pm in Ranthanbor hotel. This..."
"This was a perfect trip that totally exceeded all of my expectation. The itinerary..."
"Everything was good!! I enjoyed Ranthambore!" "Fantastic travel arrangements by Rohit at Alkof Holidays, everything was well organized..."
"Excellent India tour I have booked the tour through Golden Triangle Tours Of India..."